Just in time for Valentine’s Day! What’s better than puppy love? Well, maybe puppies!!! Ok, usually my favorite wedding inspiration shoots involve humans. 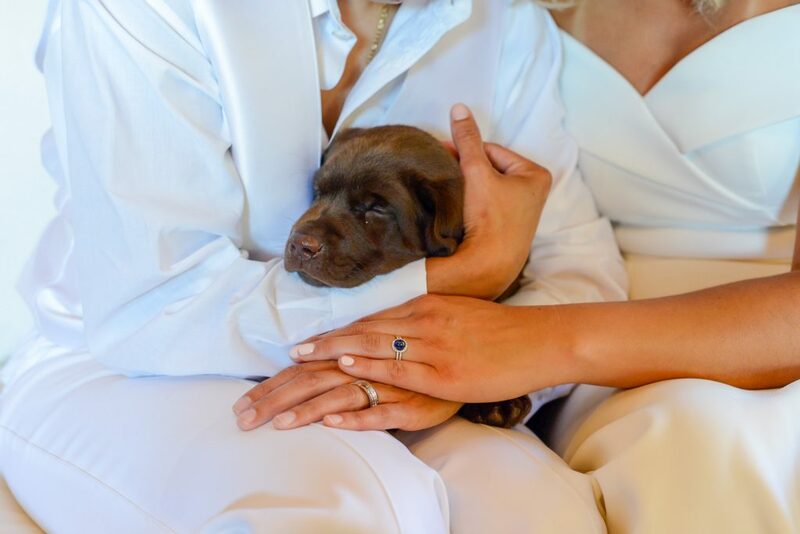 But, my friend and makeup artist Kim Baker Beauty wanted to do an inspiration wedding shoot with puppies. I just so happen to have a litter of chocolate labrador puppies from Godiva Labradors. So, together we picked our favorite wedding vendors including Bouquets and Confetti. She brilliantly organized and planned this sweet styled shoot! We were excited to have partnered with Kennolyn. Their quiet, beautiful, and exclusive Kennolyn Hilltop Hacienda Estate was perfect for our vision. Kim picked a darling couple. Thankfully, we had a fantastic wedding attire vendor to help. We chose a smart white suit and a stylish and unique wedding dress. Our vendor Epiphany Bridal Boutique is located in Carmel, California. The couple was darling and their real-life love gave us the wedding feels. The phenomenal jewelry came from Mission Jewelry in Carmel, California. Most of it was custom, one of a kind, and unique. Our florist Petal Unique Designs created some gorgeous bridal bouquets and table pieces. Andrea Casals created some really elegant acrylic signs and a stunning invitation suite with a green leaf behind them for depth. The puppies from had customized leis around their necks made by Succulents For Hire. They were so creative and added that special touch. The were so snuggly and gave kisses willingly. 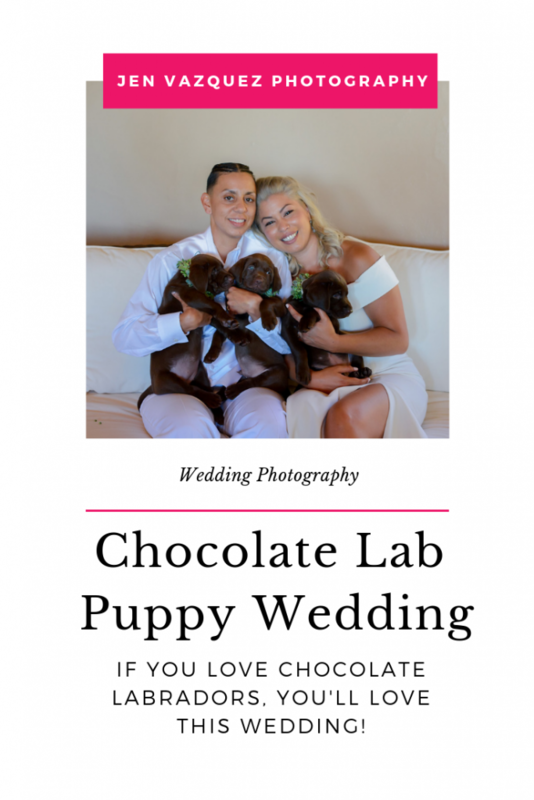 What’s not to love about a sweet cuddle with a darling chocolate lab? California Inspirations Catering out did themselves with such decadent and beautiful sweets and wedding cake. And yes — it was super yummy and all us vendors left with full bellies and our sweet tooth satisfied. And everything was captured on video so beautifully by ImPro (see the video below). I hope that you are inspired by this shoot to create some of these looks for your wedding. Check out all the fabulous wedding vendors below, if you want to recreate them! Who made this so beautiful?